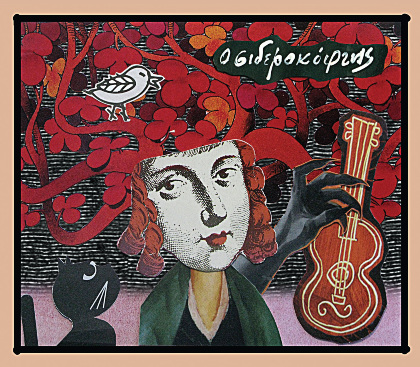 "O Siderokoftis", by the group Stelafi, is an album that confirms, in an alluring way, that important music productions have started popping up in Cyprus. In the 34 minutes of its running time, it unfolds great qualities and surprise us with the masterful way its creators are shifting between musical styles, without sacrificing the general feel of the album. The two introductory songs are flirting with the more outrospective sides of trip-hop, while, at the same time, they present the astonishing vocal abilities of the actress Stela Fyrogeni, the main interpreter of the songs. The next song (Na paris fora), creates the feeling of a liberating flight in the air, a feeling that is becoming more and more rare in greek discogrpahy. The rest of the album has a lot in store; from simple moments of honesty (Eykolia) that put the lyrics in the listener's mouth without effort, to avant-garde numbers with bacchanal lyrics (A'!Theos), bossanovas (Gia hari sou) and playful rhythmologies (Seven Flat-Headed Bubbles). The title track is an ode to tenderness, whilst the last two tracks (Lizard Dance and Apoheretismos), complete the album in a potent way, musically and lyrically. Overall, we have here a tremendously concise piece of work, made by, besides the already mentioned Stela Fyrogeni, Lefteris Moumtzis, who has also composed most of the music and Andreas Trachonitis. Other remarkable musicians e.g. 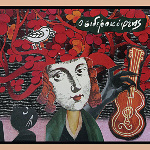 Fotis Siotas on violin and viola, take part on the album.